1954 U.S. Nationals Champions from left to right, Art Pinder, brother Donald Pinder, cousin Charlie Andrews, and brother Fred Pinder. The Pinder brothers, from Miami FL, were on the Sports Illustrated cover, something no other spearfishermen have ever done. They always shot primitive slings, while other spearfishermen used more powerful, triggered spearguns. 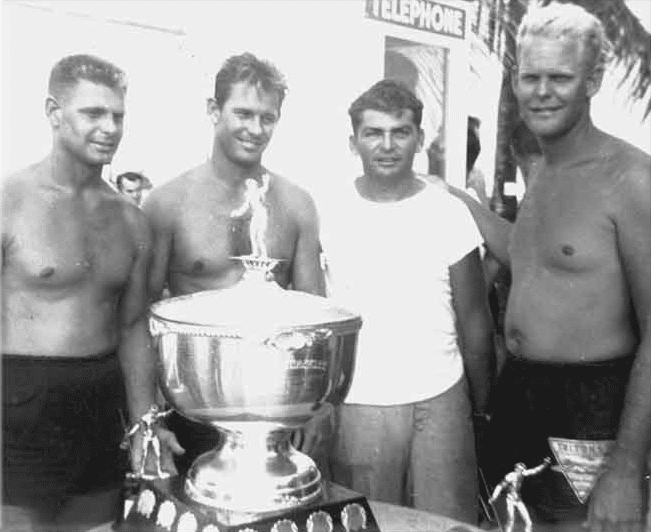 Art, Don and Fred Pinder were coming off their US Nationals Championship team win in Key West, Florida, where Don also won the 1st place individually. Art had just won the Athlete of the Year Award the year before in California. The Pinder brothers had won every competition they entered for 9 years running, but due to politics with the Nationals directors, this was their last competition together. In 1948 Art stoned an Atlantic Sailfish over 7-foot long and weighing 56 pounds, and newspapers printed the photo all over the country. In 1954 it became one of Skin Diver Magazines most popular covers. The next year Don speared an 804-pound Jewfish which is a Guinness Book World Record for the largest fish of any species. Both these fish are still IUSA World Records. Don Delmonico, from Miami FL, a US Nationals individual and team Champion from 1959, his son Dan, and Art Pinder teamed up in 1983 for one last Nationals competition. The three slingers again out-shot all the speargun teams for first place team, and Don won his second individual championship at age 49, while Art was 54. Don also won the Athlete of the Year Award in 1962. Don Delmonico became second the America to win a World Spearfishing Championship individual, with 3rd place in Italy, 1960. Don won World Team Championships in 1959, 1960 & 1961. Terry Lentz, from California, is the only America to ever win the World Spearfishing Championship, 1st place individual, which was in Malta in 1959. His 2 biggest groupers, were 47lbs and 35lbs, which put him above the Spanish and Italian Champions. With his teammates Don Delmonico and Del Wren, they won America’s first team World Championship, 3rd place. Terry also won the Athlete of the Year Award in 1959 and was on the cover of Skin Diver Magazine in 1959. Terry, Don, and Del won 3rd place team World Championship again in 1960. 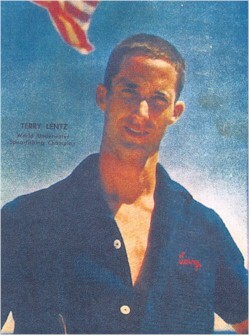 Terry Lentz won the US National Championship individual 3 times in 1960, 1961 and 1965, and the Team Championship in 1961. Del Wren, from California, won the Athlete of the Year Award in 1958, and the Nationals 1st place team. He was also on the cover of Skin Diver Magazine in 1958. Del Wren had only one leg, but he never let that stop him from winning State, National and World Championships. 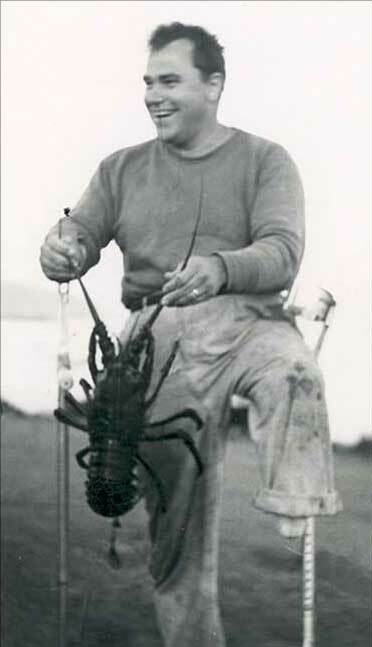 Jim Christiansen, from California, was the 1st US National Spearfishing Championship individual in 1950. He won the National Spearfishing Championship 1st team in 1956 and 1957. Big Jim also won the Athlete of the Year Award in 1957. He was the first US Team Coach in the Worlds in 1959, 1960 & 1961. Jim designed many spearfishing products and scuba diving gear. He was one of the early pioneers of scuba diving and one of the founders of Scubapro. Jim received distinguished service awards from the USOA and PADI. Gary Keffler was the 2nd American to win a World Spearfishing Championship individual, taking 2nd in Brazil in 1963. He also was on the 4th World Championship team winning 3rd place. 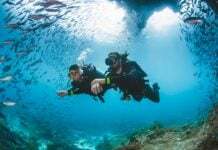 He was a commercial diver in Washington State and became the founder of the largest chain of dive stores in the Northwestern US. 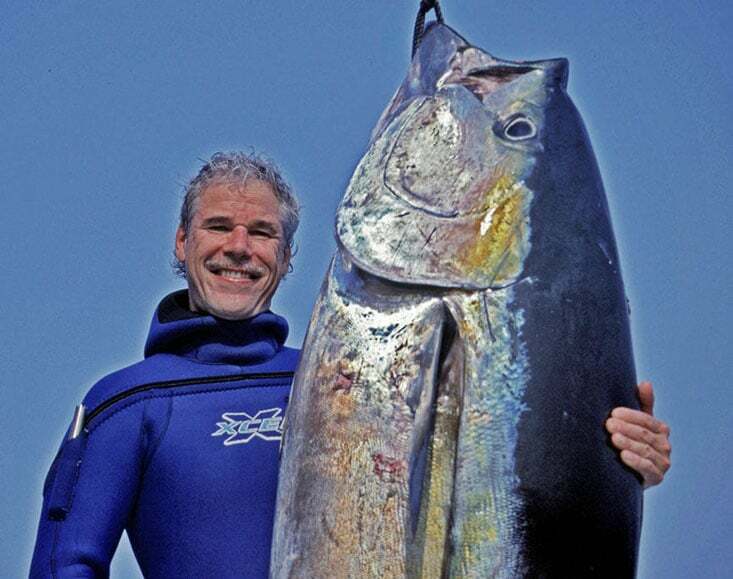 John Ernst, from California, is the first and only American to win World Spearfishing Championship individual twice, both 2nd places in 1971 & 1983. He also holds 3 Worlds 2nd place team Championships in 1971, 1975, & 1983, and 2 Worlds 3rd place team Championships in 1963 & 1965. John won the Athlete of the Year Award twice, in 1963 and 1996. John Ernst won 14 US National Championship individuals, more than 3 times his closest competitors. He won 20 National 1st Team Championships. John’s reign started in 1964 and ended in 1996.
from 1998 to 2005. Bill and his Daughter Amanda won Nationals 1st mixed team in 2009. Amanda Ernst won the US National Championship women’s individual in 2007. Terry Maas, from California, won his first US National Spearfishing Championship individual in 1966. In 1973 he joined the Ernst brother’s team and won the National Championship individual again in 1976, 1978 & 1982, and 3 team National Championships. In 1975 & 1983 he won the World Spearing Championship team, both 2nd place. Terry won Athlete of the Year in 1975, and speared a World Record 398lbs / 180.5kg Pacific bluefin tuna in 1982 that was not beat until 2006. 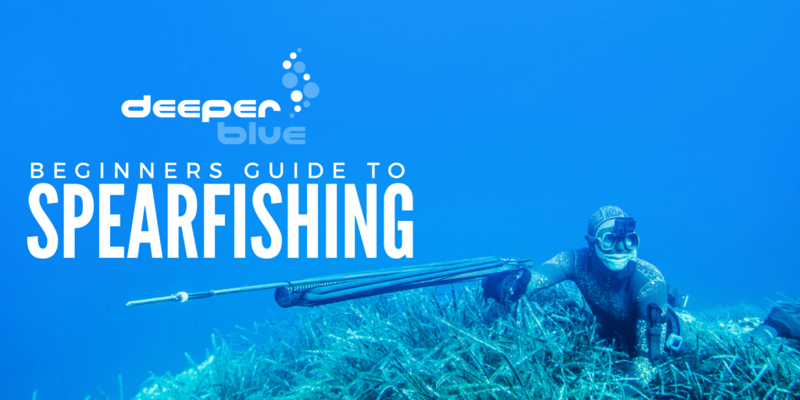 In 1995, Terry published his first book, BlueWater Hunting and Freediving, which became an all-time best seller. An accomplished videographer, Terry produced “Bluewater Hunter” for PBS and videoed “Speargun Hunter” a documentary and TV show, which he co-hosted. Terry is the developer of the Freedive Recovery Vest. Jim & Gary Zumwalt, from St Petersburg FL, are the only father and son to both win the Athlete of the Year Award. Jim in 1973 and Gary in 1981. Jim competed in the US Nationals from 1967 through 2001, and Gary from 1977 to 2001. Gary Zumwalt won the US National Spearfishing Championship 1st individual and 1st team in 1981. Ted Warnock, from Rhode Island, won the Athlete of the Year Award in 1974, shoot the biggest fish in the Nationals that year. He won the US National Spearfishing Championship 1st place team in 1984. In 1990 Ted’s proudest achievement was winning the US National Spearfishing Championship 1st place team with his brother John, and son Jim. Ted won the US National Spearfishing Championship individual award that year. Dennis Haussler, from Redwood City, CA. has won 4 National Spearfishing Championship 1st individuals and 4 1st team awards, in 2000, 2007, 2009 & 2010. Dennis won the Athlete of the Year Award in 2000. He is currently the Director of Spearfishing for the USOA. Linda Gray, from California, won 5 National Spearfishing Championship women’s individuals, more than any other woman, over a huge time period, winning in 1973, 1980, 1992, 1996 & 1997. She won the National Spearfishing Championship women’s 1st teams in 1973, 1992 & 1996. 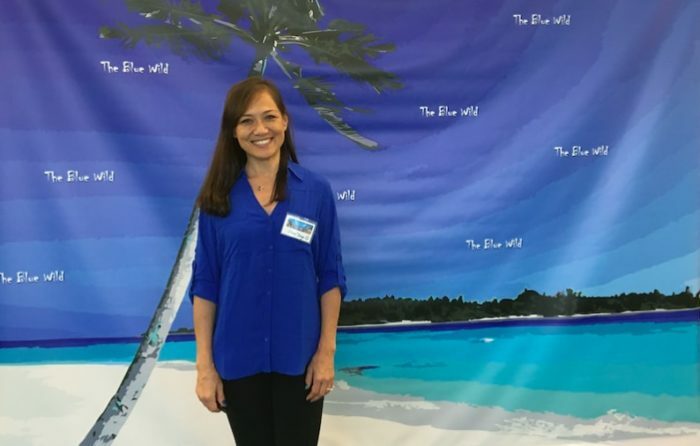 Blue Wild Expo founder Sheri Daye hopes to bring in 5000 attendees at this year’s convention. Anne Doherty from Rhode Island, won the US National Spearfishing Championship women’s individuals & teams in 1998, 2003, & 2009. She also placed 5th in the men’s division in 2005. In 2009, Anne became the first woman to win the Athlete of the Year Award. 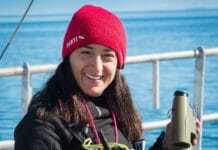 She is the first woman diver to win any of the North Atlantic Open meets and won the 2013 North Atlantic Champion. She is a women’s world record holder for Striped Bass and Bluefish.  World Spearfishing Champions – all Legendary! Claudio Ripa 3rd individual & 2nd team. Italy 1958. 3rd individual & 2nd team Italy 1959. 2nd individual & 1st team. Italy 1960. 3rd individual. Italy 1961. Bruno Hermany 1st individual Brazil 1960. 1st individual & 2nd team. Brazil. 1963. Jose’ Gomis 1st individual & 1st team. Spain 1961. Jose’ Noguera 2nd individual & 1st team. Spain 1961. 3rd individual & 1st team. Spain. 1973. Hugues Dessault 3rd individual & 1nd team. France 1963. Ron Taylor 1st individual & 2nd team. Australia. 1965. Nicolas Haeta 2nd individual & 1st team. France. 1965. Jean Tapu 3rd individual & 1st team. France 1965. 1st individual & 2nd team. France 1967. Pedro Gomez 2nd individual & 1st team. Cuba. 1967. Jose’ Reyes 3rd individual & 1st team. Cuba. 1967. Massimo Scarpati 1st individual & 1st team. Italy. 1969. 2nd individual & 2nd team. 1973. Arturo Santoro 3rd individual & 1st team. Italy. 1969. Raul Choque 1st individual & 1st team. Chile. 1971. Luciano Barchi 3rd individual. Peru. 1971. Jose’ Amengual 1st individual & 1st team. Spain. 1973. 3rd individual & 1st team. Spain 1975. 1st individual & 3rd team. Spain. 1981. 1st individual & 1st team. Spain. 1985. 3rd individual & 2nd team. Spain. 1992. Jean Baptiste Esclapez 1st individual & 3rd team. France. 1975. 2nd individual & 2nd team. France. 1981. 2nd individual & 3rd team. France. 1987. Diaz 2nd individual. Brazil. 1975. Riccardo Molteni 3rd individual & 1st team. Italy. 1981. Alejandro Flores 1st individual & 1st team. Chile. 1983. Horacio Andrade 3rd individual & 1st team. Chile. 1983. Milos Iurinchich 2nd individual & 2nd team. Italy. 1985. Antonio Toschi 3rd individual & 2nd team. Italy. 1985. Frank Zanki 3rd individual & 2nd team. Yugoslavia. 1987. Carrodano 2nd individual & 2nd team. France. 1987. Bernard Salvatori 3rd individual & 2nd team. France. 1989. 2nd individual & 3rd team. France. 1992. Pepe Vina 1st individual & 1st team. Spain. 1994. 2nd individual & 1st team. Spain. 1996. Edwin Caro 2nd individual & 2nd team. Chile. 1994. Punuaitua Teama 3rd individual. 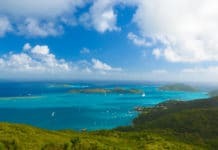 Tahiti. 1994. 2nd individual & 2nd team. Tahiti. 2000. Pedro Carbonell 1st individual & 1st team. Spain. 1996. 1st individual & 1st team. Spain. 2000. 1st individual & 1st team. Spain. 2002. 3rd individual & 1st team. Spain. 2008. Alberto March 1st individual & 2nd team. Spain. 1998. 3rd individual & 1st team. Spain. 2000. Maurizio Ramacciotti 2nd individual & 1st team. Italy. 1998. 3rd individual & 2nd team. Italy. 2002. Fabio Antonini 3rd individual & 1st team. Italy. 1998. Paulo Pacheco 2nd individual. Brazil. 2002. Stefano Bellani 1st individual & 2nd team. Italy. 2004. Ludwin Duarte 2nd individual & 1st team. Chile. 2004. Patricio Saez 1st individual & 2nd team. Chile. 2006. Santiago Cid 3rd individual & 3rd team. Spain. 2006. Joseba Kerejeta 1st individual & 1st team. Spain. 2008. Loannis Sideris 2nd individual. Greece. 2008. Daniel Gospic 1st individual & 1st team. Croatia. 2010. 3rd individual & 3rd team. Croatia. 2012. Antonio Buratovic 2nd individual & 1st team. Croatia. 2010. Bruno DeSilvestri 3rd individual & 2nd team. Italy. 2010. Jody Lot 1st individual & 2nd team. Portugal. 2012. Antonio Linares 2nd individual & 1st team. Spain. 2012. Xavier Blanco 1st individual & 1st team. Spain. 2014. Samuel Tomas 2nd individual & 1st team. Spain. 2014. Santiago Lopez 3rd individual & 1st team. Spain. 2014. Giorgos Vasiliou 1st individual & 3rd team. Cyprus. 2016. Giannis Sideris 2nd individual & 1st team. Greece. 2014. Gerasimos Kavvadias 3rd individual & 1st team. Greece. 2016.